Here at Badger Basement Systems, we count on our satisfied customers (you) to tell your family, friends, and neighbors about your positive experience with our company and the quality of our work. If you have a friend or someone you know who could use our services, simply fill out your information and your friend's information and we'll get in touch with them. We will reward you with $50 once your referral has work done with us! You can trust us to provide them with the same level of outstanding service that gave you the confidence to refer us in the first place. 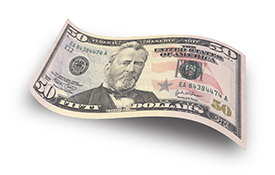 We will reward you with $50 when your referral has completed work with Badger Basement Systems.